Curator Naomi Speakman sheds light on a few of her favourite medieval gems in the collection. Gold finger ring with a diamond and engravings. England, 15th century. When I started working at the British Museum a few years ago, one of my first emails was from two members of the public about an engraved medieval ring. The couple wanted to find out the inscription on a ring in the gallery which they wanted replicated on their wedding bands because the text they’d read meant a lot to them. 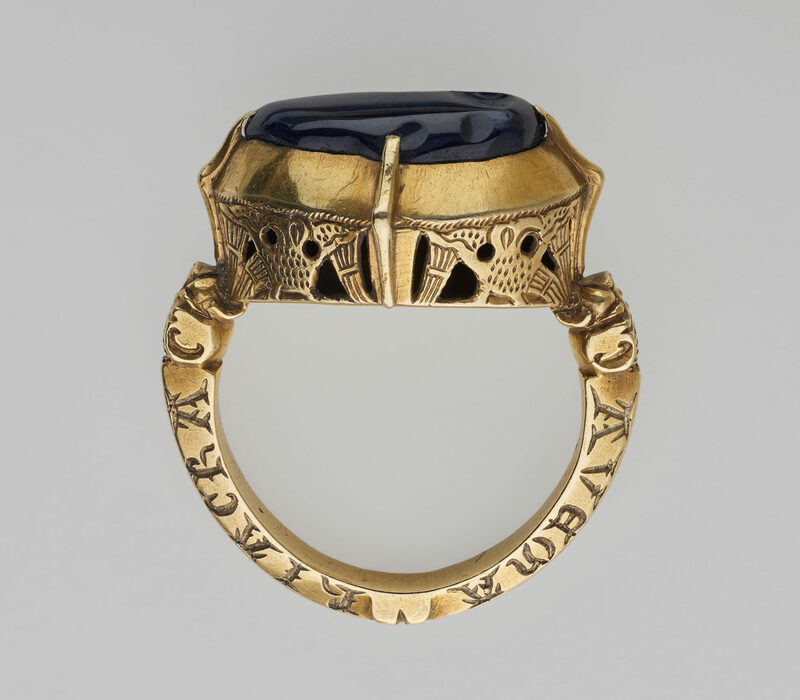 Medieval people were no different in their personal approaches to jewellery, and many different phrases and gems are to be found on existing pieces. But these weren’t purely for reasons of romance or fashion and the choice of stone was of great importance to the medieval owner. In this blog, I’ll be telling you about some of the pieces of medieval jewellery I care for in my job as curator. The symbolic properties of gemstones in the Middle Ages lay in the biblical description of the heavenly city of Jerusalem, as described in the Book of Revelation. The city was described as made ‘of pure gold’, with each foundation of the walls embellished with a gemstone, such as ruby and amethyst, and each of the twelve gates being made of a pearl. The properties of these gems, and others, were recorded in tracts on stones known as ‘lapidaries’. 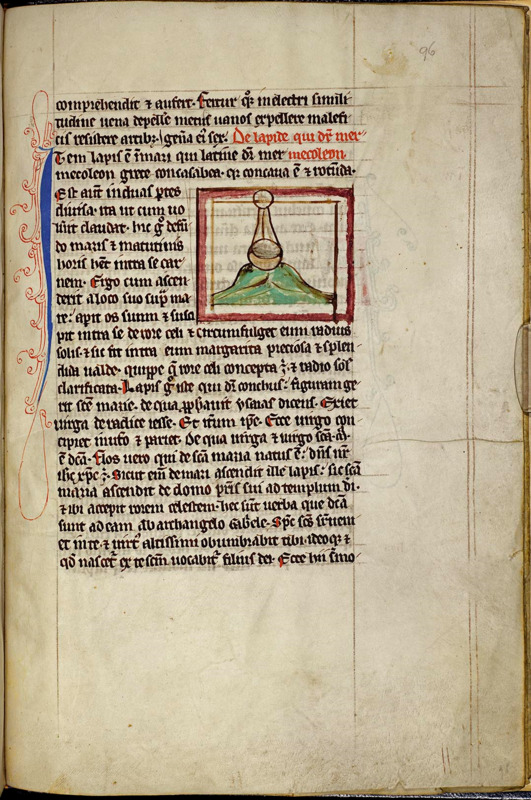 These treatises are connected with bestiaries, books which provided detailed accounts of different beasts, tied to a Christian, allegorical story. Folio 96r of the Aberdeen Bestiary. England, c. 1200. © University of Aberdeen. When it [the oyster] rises from its resting-place to the surface of the sea, it opens its mouth and takes in some heavenly dew, and the rays of the sun shine around it; thus there grows within the stone a most precious, shining pearl indeed, conceived from the heavenly dew and given lustre by the rays of the sun. The stone, therefore… symbolises Saint Mary. Both freshwater and seawater pearls were used in the period – the freshwater variety could be found in rivers in Britain, Ireland and France, and seawater pearls were from the Mediterranean and further afield. 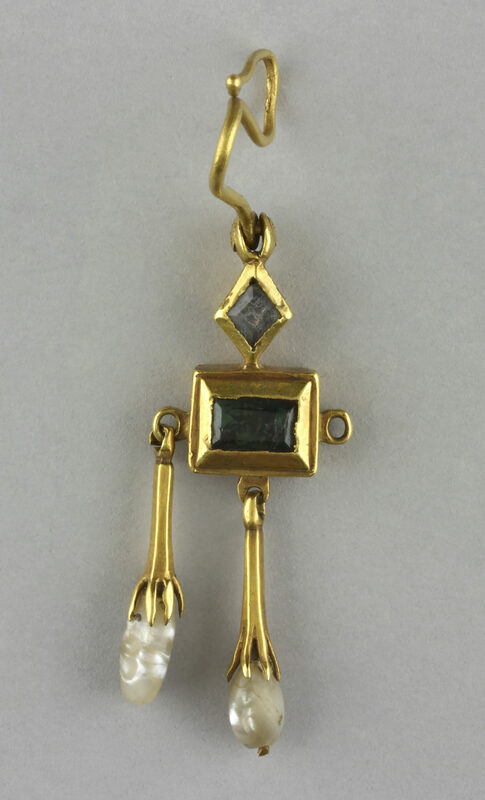 Few medieval pearls have survived on objects in the Museum’s collection and this earring shows us why. Gold earring with crystal, pearls and emerald. Halkida, Greece. The gold earring is set with a clear crystal and an emerald. Below these are suspended two gold trumpets, each with a pearl at its end. When we look closer we find that the pearls have been drilled and are held in place by a thin gold wire forming a delicate pin. Originally, it would have had three of these projections. For archaeological jewellery, such as this earring (which was from a hoard of merchant’s goods found in Halkida, Greece), the pin and pearl could easily become lost or damaged. Finger ring set with a cabochon sapphire. England, 13th century. One stone which has been discovered in medieval tombs is the sapphire. 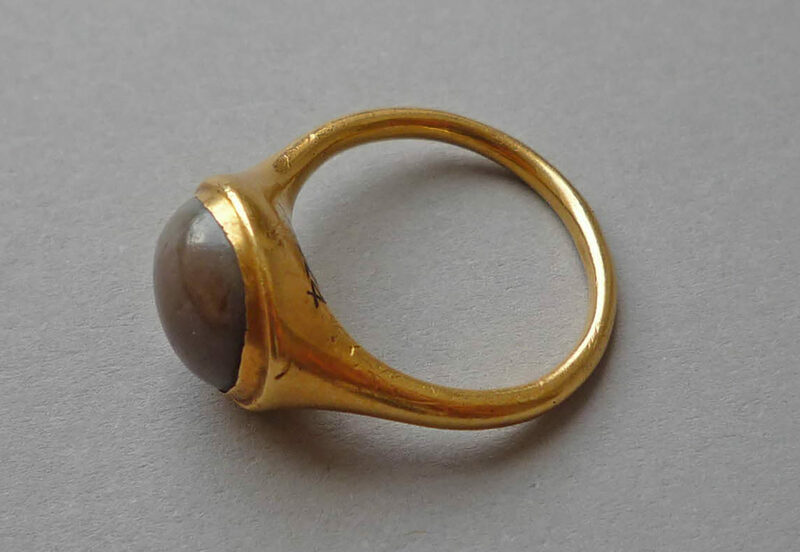 Particularly popular for bishops’ rings, sapphire set rings have been found in the grave of Walter Gray, Archbishop of York (d. 1255), and said to have been found in the grave of William Wytlesey, Archbishop of Canterbury (d. 1374). You can see the incredible detail on this example which was found in the Somerset village of Cannington. The sapphire is very large and it is set in its uncut, highly polished form. 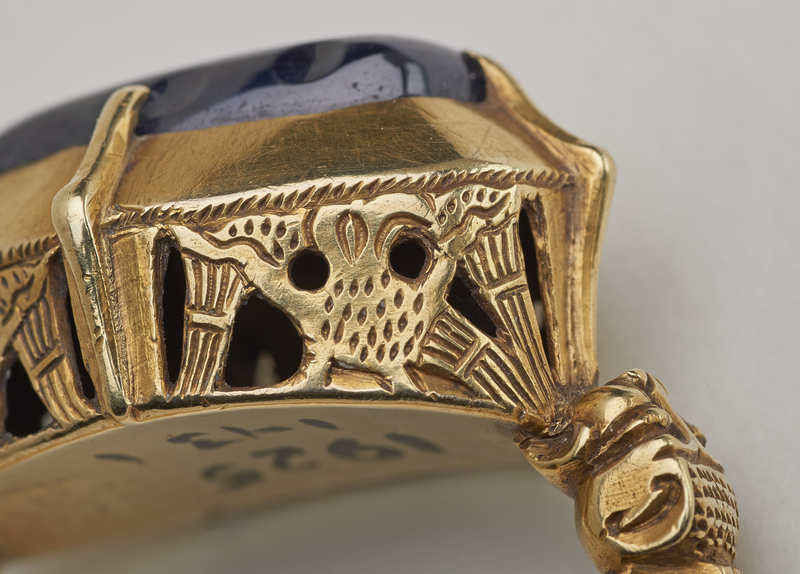 Detail showing the sides of the finger ring, decorating in openwork with engraved birds. England, 13th century. Below the stone, the decoration is openwork, with birds with spread wings and turned heads. Under this, two open-mouthed beasts bite the base of the birds connecting to the hoop. The animals have round, bear-like, ears and tiny dots representing the mane or fur. Along the hoop is engraved Latin text, ‘Ave Maria Gratia Plena DMI’ or ‘Hail Mary Full of the Grace of the Lord’. Bishops were given a ring for their investiture ceremony, which symbolised their vow to serve the church faithfully. The sapphire, then, was a logical choice, as it represented chastity in marriage, as the churchman was married to God. Unlike the uncut polished stone in the sapphire ring, this next ring is set with a diamond, cut to form a pyramidal shape projecting from the bezel. In the 1400s the use of the cutting wheel meant that diamonds could have different outlines and facets could be cut into diamonds more easily. The stone was associated with purity and was popular with royalty. This diamond is set into a chunky 15th-century English ring. It is a type called ‘iconographic’ because it is engraved with images of saints. 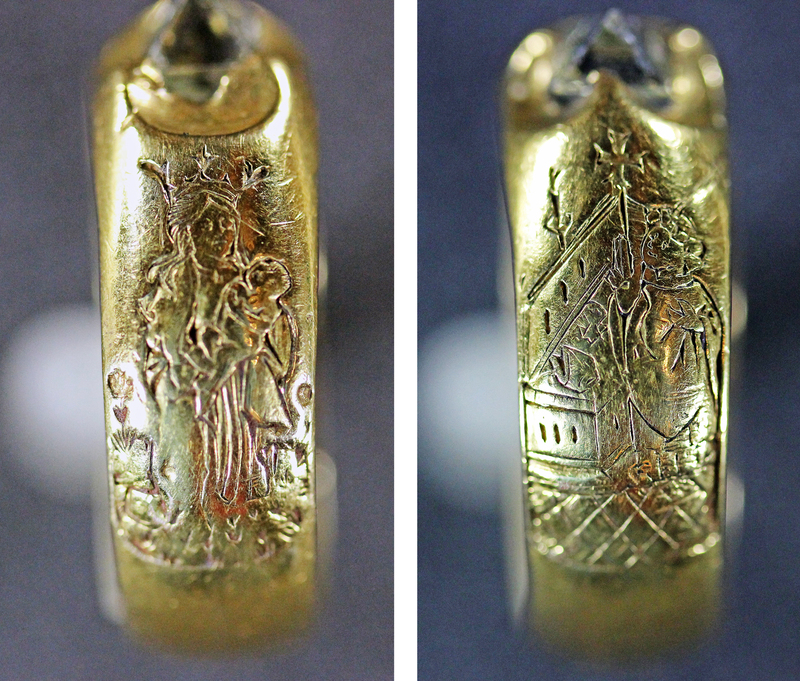 Gold finger ring with a diamond and engravings depicting the Virgin and Child (left), and St Thomas Becket (right). England, 15th century. On one side is the crowned Virgin Mary holding the infant Christ and on the other is St Thomas Becket, kneeling at an altar with a sword impaling his head. 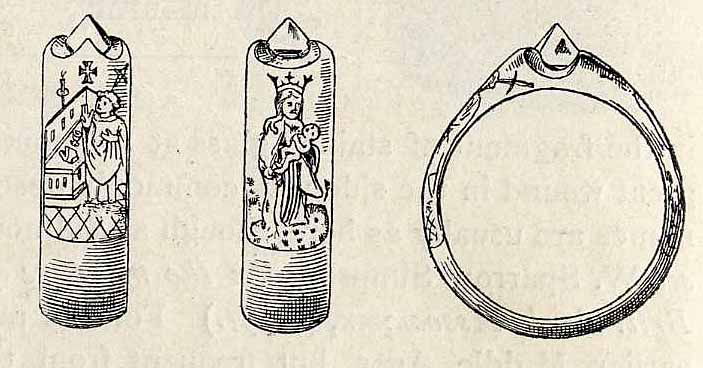 Illustration of the gold finger ring with a diamond and engravings depicting St Thomas Becket (left), and the Virgin and Child (middle). The illustration shows the diamond setting on the right. England, 15th century. It is said that in the 15th century the tradition of an engagement ring set with a diamond came into practice, although the exact date is not known. In 1477 the Archduke Maximillian of Austria married Mary of Burgundy and her betrothal ring was set with a diamond. Gold amulet ring, 16th century. One of the oddest medieval stones is the ‘toadstone’. 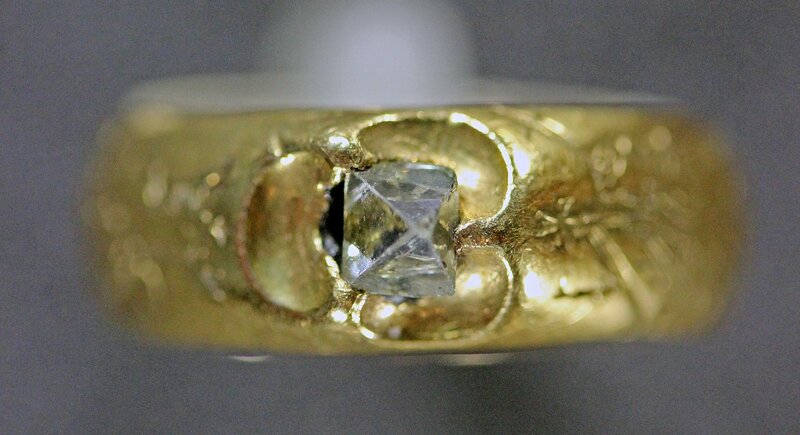 You can see it on this 16th-century ring. It is a smooth, shiny dome which is a mottled brown colour. O M Dalton, in his 1912 catalogue of the Museum’s ring collection, tells us that ‘the toadstone was supposed to be carried by the toad in his head, whence it might be cut out, or to be thrown out of the mouth if the creature was placed upon a piece of red cloth’. This stone was worn to protect the owner from kidney stones, to protect newborns and to identify poison. However, the stone had no connection to a toad whatsoever, but instead is the fossilised tooth of a fish, Lepidotus maximus.